All Fill Model BSV600, semi-automatic, servo driven, 316L stainless steel, auger filler capable of speeds up to 120 cycles per minute with accuracies of +/- 1% and pounds of product per hour – depending on materials and application. 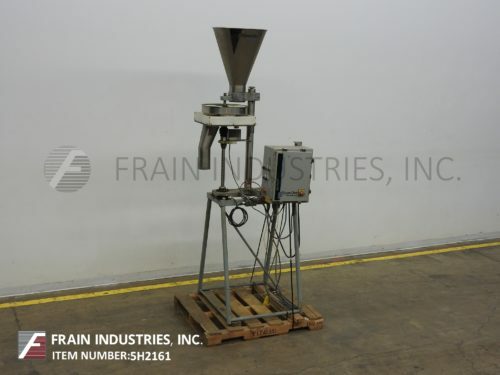 All 316L stainless steel contact parts, 3A dairy wipedown construction, (22" diameter) 16 gallon product hopper with agitator, and dust cover with 6" diameter product duct. A/B controller with AB Panel View swing arm touch screen controls, auger motor, with servo driven, electro magnetic clutch / brake, start, reset, and E-stop. Mounted on stainless steel frame with casters.